'What About Me' (Thomas Johnson, R. 2011 ) Seedling #TA112A, IB. 27.5 (70 cm). Midseason bloom. Standards and style arms soft yellow; falls white, soft yellow band; beards blue; sweet fragrance. Seedling #TW128A: ('Quite The Reverse' x 'Mythology') X 'Bluebeard's Ghost'. Mid-America 2011. From Mid-America Garden catalog, 2011: WHAT ABOUT ME (T.Johnson ‘11) IB Midseason 30” (76cm). What About Me is one of those lovely irises that is too beautiful to throw out but that also doesn't fit well in any of the classes. 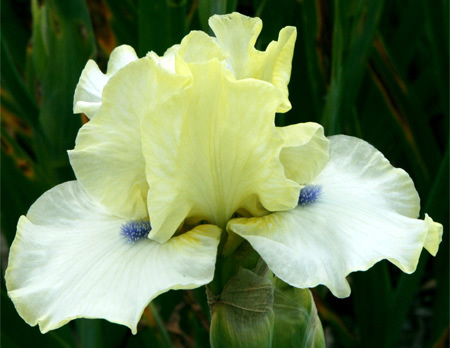 Best thing to do is put it in a class and say, "grow it and enjoy it for the fantastic garden iris it is". Standards are soft yellow as is band around white falls. Soft blue beards are the perfect accent. Sdlg. TA112A: (Quite the Reverse x Mythology) X Bluebeard’s Ghost. $24.00. JPG whataboutme02.JPG manage 48 K 16 Jun 2014 - 02:26 Main.TLaurin Photo by Don McQueen,London, Ont. Canada Zone5.